Then an incredible thing happened. One winter my eczema didn’t appear. No eczema. This can’t be possible? After practically life-long eczema it seemed unlikely that it had disappeared all on its own. It was that same year that I had had enough with hypothyroidism. I wasn’t going to let this disease define me and I got into the best health of my life, digging through the scientific literature on hypothyroidism and reading anything and everything on hypothyroidism. Finding a fabulous doctor who really listened to me and I was feeling the best I had in years. And guess what? That eczema that I had endured for almost 40 years disappeared and it hasn’t reappeared for nearly 8 years now. If you’ve been following Hypothyroid Mom for any length of time, you know that I’ve mentioned that I suspect now that I had undiagnosed hypothyroidism since I was a wee child, for as long as I can remember having that eczema too. Do you see the connection? If you’re suffering from dry, itchy, flaky skin or have psoriasis or eczema, it’s likely you’re not thinking about your thyroid. Why would you? When you’re dealing with something as conspicuous and painful as a rash, it’s difficult to think about anything other than getting rid of it on the surface. Believe me, I know. Before I went gluten-free and healed my gut, I suffered from chronic eczema and other skin issues. I would have done almost anything to get rid of the embarrassing rashes and visible inflammation. Now I know that eczema, psoriasis, and other skin rashes are never just skin deep. Your skin is more like a signal of what’s going on inside of you … a signal that everyone can (unfortunately) see. And for the estimated 20 million people in the US who suffer from thyroid disease, the prevalence of skin rashes is even higher. Let’s dig into some of the ways your thyroid, your gut, and your skin are related, and where to start on your healing journey if you suffer from thyroid skin rashes. 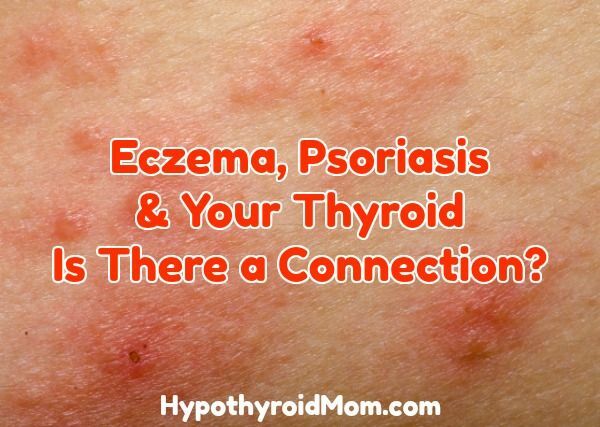 What Does Your Thyroid Have to Do With Eczema and Psoriasis? Your thyroid is well known for regulating your body temperature and metabolism. But there’s way more behind the scenes at play. Thyroid hormones have receptor sites in every cell in your body; meaning an underactive thyroid has the potential to disrupt cell metabolism and detox throughout your body. There are two major ways your thyroid and skin health are related. You simply cannot have healthy gut function with a poorly functioning thyroid. All of these symptoms make it tough for your body to process and excrete toxins. The more your body holds onto toxins, the more we begin to see the physical ramifications of this in the form of rashes and other skin issues. Leaky gut and SIBO wreak havoc on your gut lining and can even trigger autoimmune diseases that includes dermatitis herpetiformis, vitiligo, psoriasis, dermatomyositis, lupus, Hashimoto’s Thyroiditis, and even eczema. Hypothyroidism reduces blood flow to your skin. While your skin is an organ, it also happens to be of the lowest priority. And reduced blood flow to the lowest priority organ (your skin) means a couple of things according to acupuncturist Brie Wieselman, L.Ac. First, nutrients and oxygen can’t properly flow to the skin cells to aid in detox, repair, and regeneration. As a result, the environment around your skin cells can become rather toxic and unhealthy. That certainly makes it difficult for healthy cellular turnover. And the cells themselves don’t have enough nutrients vital for healthy turnover (which happens about every 28 to 40 days). When you can’t make healthy new cells, that’s how you end up with unending skin rashes. Second, when you have hypothyroidism, there are also less thyroid hormones in general to aid in cellular metabolism, which prevents the skin from releasing toxins properly. When #1 (gut dysbiosis and a higher toxic burden on the inside) and #2 (decrease in blood flow inhibiting the skin’s natural detox capabilities) combine, it’s a perfect storm for a massive buildup of waste, which can trigger a myriad of skin issues, eczema and psoriasis just being two of them. There’s a reason that dry, itchy, brittle skin, hair, and nails are some of the first physical symptoms of hypothyroidism. This is also the reason why slathering yourself in lotions and steroid creams rarely work. When you can’t shed old skin cells or excrete toxins properly, your body can’t create new, healthy skin cells either. Most lotions are just adding to the problem, making it harder to shed the old and let the new flourish. If the underlying cause of your skin rash is related to a thyroid disorder, it’s important that you look at your healing with a holistic lens. Your thyroid regulates nearly every metabolic pathway in your body, affecting everything from your brain to your digestion to your skin. No amount of steroid creams or topical potions will, for instance, heal the lining of your gut or reduce systemic inflammation. To help get you started, here are some steps to healing from the inside-out. I often tell clients that you can’t outsmart or out-work your thyroid. If your levels are not optimal (or close to there), it’s difficult to get your skin back on track since so much of its healthy function is tied to your thyroid. From there, you have the opportunity to work with your doctor to address if medication is necessary or if your dosage needs adjustment. And sometimes you may need to shift away from a T4 replacement drug to a T3/T4 combo like Armour in order to start seeing improvement. This piece is critical because I’ve found with clients that dialing in your thyroid medication will allow for faster improvements. You’ll no longer be fighting against the current to get your thyroid skin rashes to resolve while working on the other pieces of your skin rash puzzle. The first line of defense when it comes to healing skin rashes is to identify your food triggers. Eliminating inflammatory and triggering foods will not only help short-term inflammation and flares, but will help heal your gut long-term as well. Triggering foods can increase inflammation of your gut lining making it really hard to digest and assimilate nutrients from your food. To be fair, eczema specifically has more potential food triggers than those which are typically recommended for addressing Hashimoto’s and other autoimmune diseases. There are more common food triggers like gluten, dairy, and eggs. Unfortunately, many integrative practitioners agree that while no clinical data exists, eggs are often problematic for those with eczema. By no means should you attempt taking out all of these foods at the same time. Each of these triggers contain a lot of different common foods. Doing so will be utterly overwhelming without any guarantee that you’ll actually feel better. You can test out each one at a time for a week or two, but ultimately this should be coupled with checking out gut function and identifying any potential gut infections or dysbiosis. Removing food triggers alone will not resolve your eczema skin rashes if there are underlying gut issues that must also be addressed. Besides sugary and processed foods, stress is enemy number one when it comes to healing thyroid function and skin rashes in general. You are probably familiar with cortisol, a stress hormone created by your adrenal glands in response to any sort of stress. Cortisol gets a bit of a bad rap because we usually associate it with excessive stress and burnout. But you need cortisol to function, so it’s not all bad. I like to approach cortisol management as more of a balancing act, rather than blatantly trying to inhibit output. We need cortisol in order to thrive, but we certainly don’t want too much as it can lead to extreme fatigue over time. And high cortisol levels over time make it harder to rebalance your thyroid! One very common complaint of people with skin rashes is the non-stop itching (especially at night). It appears that there is a connection between stress, cortisol levels, and how itchy your skin is. Elevations of cortisol appear to rise as itchiness increases. This is a pattern often seen in those with disruptions in circadian rhythm where cortisol becomes elevated at night when it should be much lower. That’s why it’s so important to manage your stress and get your overall circadian rhythm back on track. Remember, stress doesn’t always have to be a huge life event or even something bad. It could be something as seemingly harmless as reading the news every day or sitting in traffic for an hour. Work or a new baby or planning a wedding all sound positive enough, but even happy planning can get in the way of valuable self care. Take some time for yourself, even in small ways throughout your day and notice the difference. Your skin is one of the largest organs and it also has the capacity to absorb what’s placed on it. Hormone-disrupting lotions, cleansers, and beauty products line the shelves of every drug store and beauty counter. Even some of the most expensive brands on the market contain chemicals that can alter your body’s natural hormonal pathways and really screw up your thyroid. Even many that promise dry skin relief for those with eczema and psoriasis are often loaded with this type of chemical junk. So don’t be fooled by the marketing claims made on products like this that they are necessarily good for your skin and body. Screen your personal care products for endocrine-disrupting chemicals via the Environmental Working Group’s Skin Deep database. It’s an excellent resource that will help you figure out what’s safe and what’s not. From there, start clearing out your cabinets. Start with skincare and body care products, then replace candles, perfumes, other sprays, soaps, and cleaning supplies. Since I’ve personally been around the block when it comes to debilitating skin rashes that just won’t go away, do not despair! There certainly is hope. Just keep in mind that most people have 3 to 4 different skin rashes triggers (your thyroid function is one of them). It’s imperative to be comprehensive on your quest so that you identify all of the root causes and efficiently address them. The first place to start is looking at your diet and thyroid function. My doctor used to do a thyroid panel every year because I’ve had a goiter for over 20 years. They’ve stopped doing it so often because they can’t justify it to insurance when my numbers are always normal. The last time they did them was fall of 2017, and the only thing abnormal was my thyroglobulin and anti-thyroglobulin were elevated, and my RT3 was at the very top of the range. Over the last few months though, I’ve started needing 1-2 naps per day, I’m always tired, always freezing. and most of my body is covered in extremely itchy eczema. any ideas how to talk them into it? I have a very lazy thyroid. 4 weeks ago my NP cut my meds from 325mg to 190mg. She’s hoping it will jump start my thyroid. 2weeks ago I started getting a rash on my elbows. It’s now all over my knees, too. I went to urgent care & was diagnosed with eczema. I was shocked. I’m already grain & sugar free. Could there be a correlation between the drop in meds & the eczema? Perhaps I need more meds again. I’m on Naturethroid. Hi, I’m actually borderline Hyperthyroid but have been suffering with Psoriasis/Eczema for 25 years and it’s just getting worse. I notice in the article you mention nickel allergy as a possible culpert. I’m pretty sure I have this allergy as I have to cover the metal button on my jeans on the inside or else I break out really bad from the nickel. Just wondering if the nikel I’m ingesting may be the root of my skin problems! All the dermatolgist I’ve seen over the years have only tried to cure with drugs which never work, not even all the new biolgoics, I’ve been self injecting these for 2 years to no avail!!! Hi Lenna. I know how you feel. I suffered with skin issues due to thyroid issues. Years ago I went to see an herbalist who recommended herbal supplements. As a result I started selling herbs to people who suffered with rashes, psoriasis. I changed my diet drastically by becoming vegan. I know that may sound discouraging. I also took colon cleansing herbs. I was given a remedy from my doctor. I thought he was crazy, but I tried it. You must be determined, but what he recommended for me saved my life. Also I was infested with parasites. The formula he recommended killed the parasites, but it took some work especially mentally. The holistic way of living, I wanna say that it saved my life. Go to your doctor an ask him to prescribe you betamethasone cream 5 percent it is for for skin comes in cream form an if the at ate a is too large ask for pill form two applications an its almost gone will stop the itching instantly you will get relief. I have been treated for hypothyroidism now for 7 years with Armour. About 4 years ago my ears started to bother me and now I have full blown psoriasis in my ears. I am also post menopausal and take bio identical hormone’s are for testosterone and progesterone as I seem to make none of those that have unusually high estrogen. All that to say I’ve been a wreck mess for about 10 years. I have read countless articles on the matter. Here’s what I find frustrating there is a whole lot of what you should not do it I need a clear comprehensive list of what I can do. I found this article a little wordy and overwhelming and finished it still with no idea how to help myself as far as diet. I found choosing just one thing to change at a time makes it less overwhelming. For example, if gluten is something you need to take out, just concentrate on that. Learn all you can on that. Switch things out that are easy like pasta, bread and flour. Just take one step at a time. Little changes at a time are easier to keep. Don’t give up!